We are currently in the throes of preparing for our upcoming exhibition New Zealand in Vogue, which opens in the Eyelights Gallery on 24 June. The exhibition is inspired by the decade during which New Zealand had its very own Vogue magazine – 1957 to 1968. The exhibition features garments and accessories by New Zealand designers and manufacturers whose creations regularly graced the pages of Vogue New Zealand. 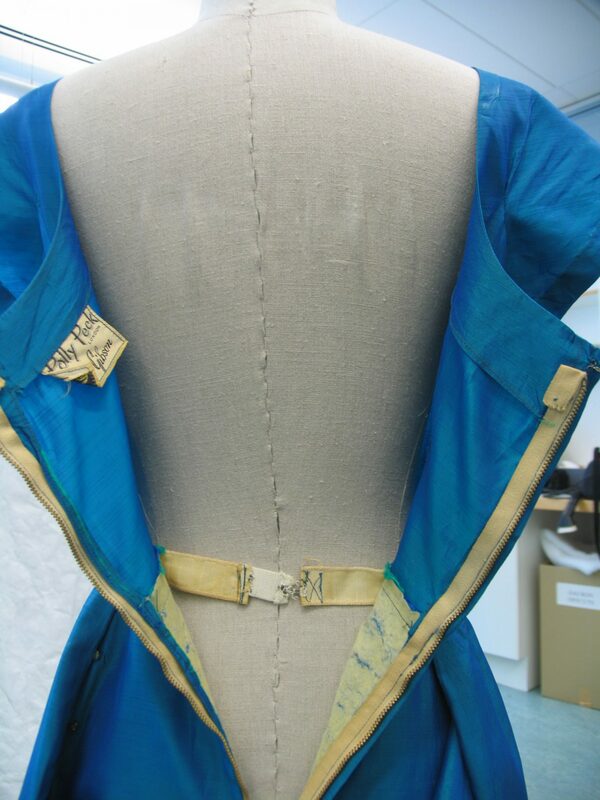 Currently, the garments are being prepared by our Textile Conservator, Anne Peranteau, for photography and display. The garments are being exhibited on ‘standard’ dress forms, ranging in sizes 10 to 14. However, as most women know, there is no such thing as a ‘standard’ size. What might fit beautifully across the bust, might gap or pull at the back. What sits snugly at the waist, might fall off the shoulders and so on. While women use a range of tricks, from highly engineered foundation garments to plastic surgery, to force their bodies to conform to fashion’s changing ideals, Anne Peranteau is applying similar tricks of the trade to our dress forms in order to bring back to life the figures of the women who once wore these garments. Anne has been busy enhancing bust lines, and happily fabricating bulges for all the ‘wrong’ places – ensuring that our perfect forms have the tummies, hips and curvy derrière synonymous with an hour glass figure. I will now hand you over to Anne, for an insight into how she does it! The garments in the exhibition date from 1957 to 1968, a period characterised by the lingering influence of Christian Dior’s New Look. The so-called H line featured fitted bodice and full skirt flaring from a drawn-in with a broad shouldered jacket. Some garments requiring a special shape are exhibited at Te Papa on custom forms, sculpted of archival polyethylene foam. Such is the case with the 18th century silk brocade bodice currently displayed in Enriching Fashion. The carved form made for the bodice enables the displayed garment to assume the conical shape that it would it would have had on the body, due to the corset worn underneath it. Each custom form takes days to construct however, so the 19 dresses in the New Zealand in Vogue exhibition will be displayed on standard Purfex forms, modified to adopt the silhouette of late 1950’s and early 1960’s fashions. The mannequins are typically fitted to each garment based on the waist measurement, but because the mannequins have a quite contemporary shape, the bust and hips usually need to be augmented for the 1950’s era dress to fit properly. 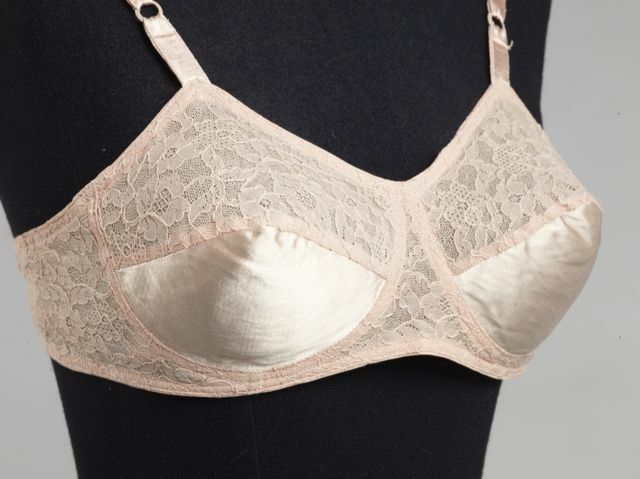 Even the relatively simple chemise dresses of the 1960’s had a differently shaped body underneath, keeping in mind what was imparted by period undergarments (for example, contrast the shape of the bust created by this 1950’s brassiere, Fig. 2, with the bust of the contemporary mannequin). Bra by Berlei (N.Z.) Limited, 1950 – 1959. Purchased 2003. Collection of Te Papa. It is important to be observant of the clues given by the garments themselves. One of the dresses in the New Zealand in Vogue exhibition is a lively peacock blue cocktail gown that was worn by the museum’s previous textile conservator, Valerie Carson, for a birthday in 1957. The party was particularly special as it doubled as her engagement party. The bodice of the gown flares slightly from the waist; this shape is accentuated by the wide neckline. Bodice front and sleeves are cut from a single piece of fabric. The full skirt is stiffened with Vilene interfacing and the waist is kept pulled in with assistance from an elasticated fastening on the interior. there was far too much ease, or gapping, in the bodice on all sides, making it difficult to appreciate its flared shape. the fullness of the skirt was falling in deep folds around the mannequin pole, with buckling around shaping darts, creating an overall impression of something wilted. 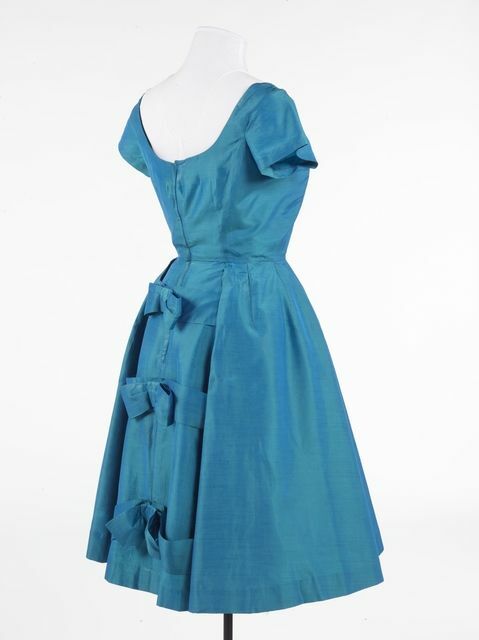 Dress by Polly Peck, 1957. Gift of Valerie Carson. Collection of Te Papa. 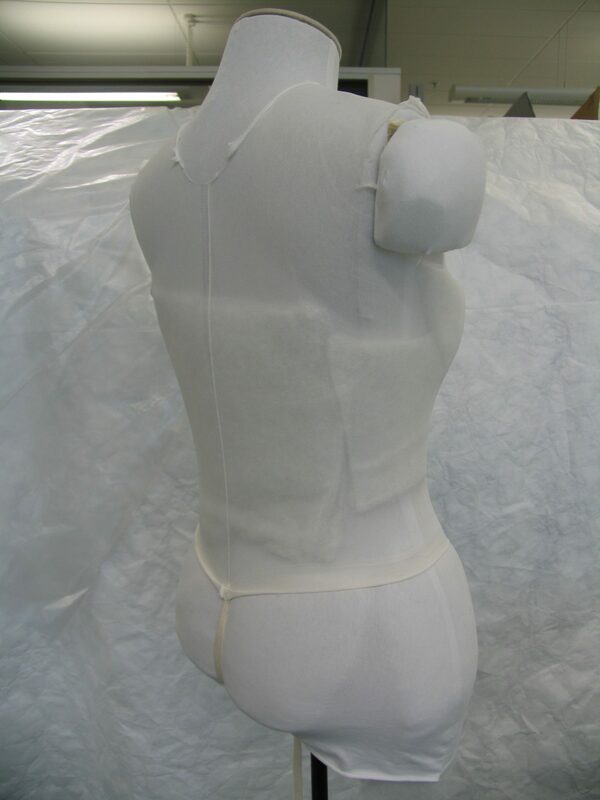 The mannequin was padded out across the back, hips and bust with archival heat bonded Dacron polyester (image below). Compared to the adhesive bonded variety of padding, this type is safer for the objects on long term display. The Dacron padding is readily shaped to approximate the appropriate anatomical features. When dressing body-clinging knits and tight fitting garments, it is helpful to tear rather than cut the Dacron, to prevent the edges of the padding from being visible under the garment. The padding is inserted underneath the slipcover, which we have made from a pair of nylon stockings (XL, and do not use control-top!). and secured to the mannequin with woven tape stitched at centre front and centre back of the waistband. Once the padding out is completed it is sometimes necessary to cover the whole assembly with a show cover to keep everything tidy and invisible. Mannequin padded out with Dacron. A bespoke cotton and tulle petticoat, made by volunteer Dorothy Bradey, was used to create the proper flared shape in the skirt of the dress (the original underskirt is not in the museum’s collection). Period undergarments are sometimes be used when dressing mannequins, but particularly for older items of historic dress, reproductions (or unregistered “props”) are preferable because of concerns regarding the strain placed on bustles, cage crinolines, and similar items when supporting garments. 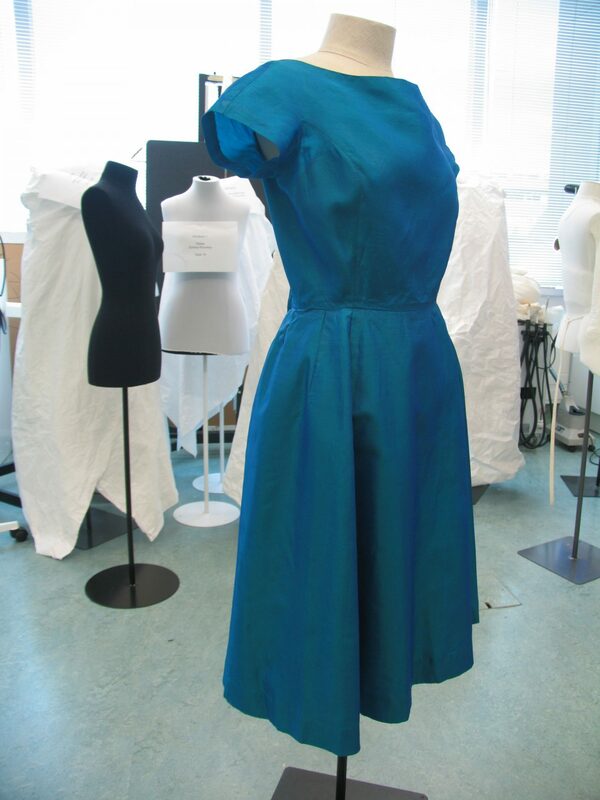 The appearance of the dress at this stage can be seen in the final garment, now ready for photography and display. Finally, just a word about conservation. 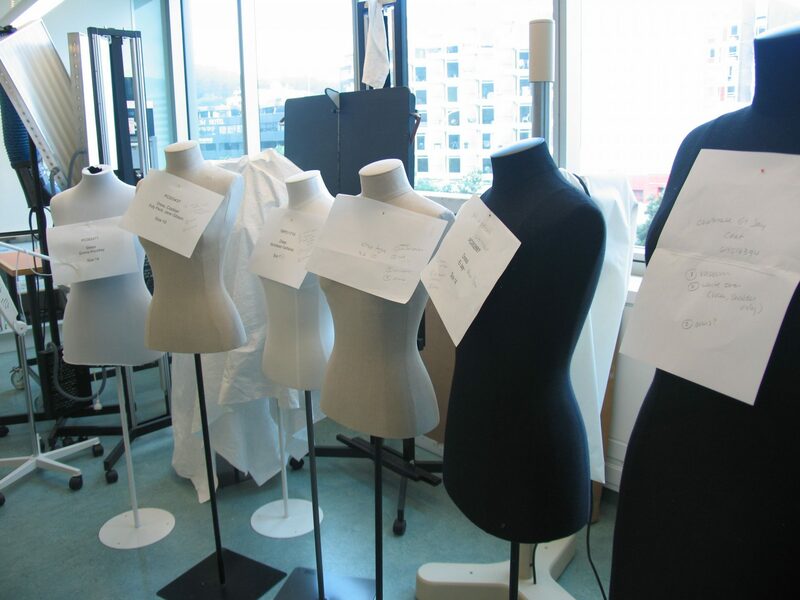 The process of putting a garment on a mannequin can place momentary but significant strain on seams and fabrics. Getting the waist seam of a extremely fitted garment past the shoulders and bust of a fiberglass mannequin is a completely different experience than getting it on a flexible, fleshy body. Once a dress is on a mannequin the shoulder areas and waistbands or waist seams usually bear most of the weight of the garment, and they do so continually over the length of an exhibition. Before beginning the dressing process, careful condition checks are done to make sure that each dress can withstand this. Fastenings are also checked to make sure they are secure and functional, and if not, it must be determined whether they can be replaced. Conservation treatments may be carried out to reduce staining, stabilise weak areas and generally make the costume safe for long term exhibition. Purfex mannequins (model FORM001) were used. Some very helpful tips there. Very useful tips. Thanks for posting this. We are about to put wedding dresses on dress forms so may need to use the ideas in this post. Thanks. Those mannequins get a lot of preening to great effect – interesting to know what goes under.